Raipur, January 8: Delhi’s women paddlers caused the biggest upset of the championships, riding their way into the history book by entering the team championship final of the National Table Tennis Championships at the Balbir Juneja Indoor Stadium here today in decades. 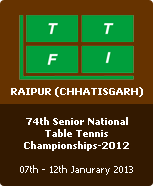 Raipur, January 7: Maharashtra ‘A’ women, last year’s champions, should walk into the final of the team championships, if one goes by the pre-quarterfinals draw decided at the of the National Table Tennis Championships after Stage 1 matches at the Balbir Singh Juneja Indoor Stadium here today. They beat both Andhra Pradesh and Rajasthan in Group A with an identical 3-0 margin to take the top perch. Raipur, January 6: The record number of entries from teams for the Senior National Table Tennis Championships, starting here at the Balbir Singh Juneja Indoor Stadium from tomorrow, is an indication of the growing popularity as well as the importance of the event.